Floating World Gallery – Lily Pond – Villa D’Citta Wedding Photos! Beautiful Wedding Photos in Lincoln Park, Chicago! It was a beautiful day for a wedding in Chicago for Lisa + Ken! We took so many photos around the Lincoln Park area…the Alfred Caldwell Lily Pond, Villa D’Citta + the Floating World Gallery! Here’s one of my favorites from the Lincoln Park Lily Pond. Lisa + Ken chose an amazing wedding venue in the Floating World Gallery in Lincoln Park! We were also one of the first weddings with their new exotic hardwood floors! I was also excited to work with the amazing team from Truffleberry Market – one of the best Chicago wedding catering companies! We started the day at the amazing Villa D’Citta! Chicago’s Best Bed & Breakfast on Trip Advisor! They have amazing decor and amenities for their guests! The decor made my job as their wedding photographer pretty easy! 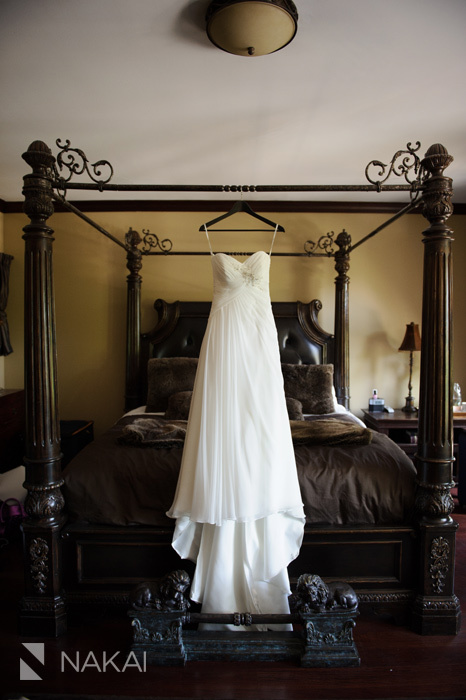 I just hung up the wedding dress! A portrait of the beautiful bride and her wedding bouquet! She wanted to see herself in the mirror…I think the Villa D’Citta bathroom had a plenty of mirrors for her! Sharing a kiss on their wedding day! The Villa D’Citta decor allows for a photo to incorporate the environment! We had to take a photo on the Villa D’Citta marble staircase! Love this greenery and the black spiral staircase of this Lincoln Park home! 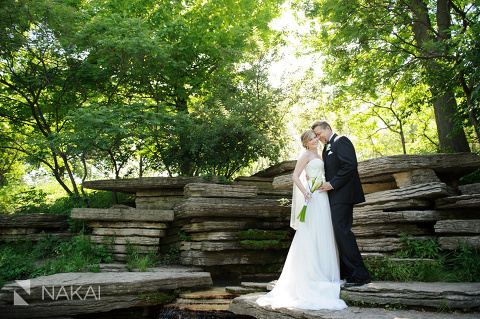 Wedding Photography at the Chicago Lily Pond in Lincoln Park! Bridal party photo at the Alfred Caldwell Lily Pond in Lincoln Park! I loved setting this photo up- such a grand wedding picture at the Lily Pond! Floating World Gallery Wedding Ceremony Photos! I was excited to shoot a wedding at the Floating World Gallery as it is a relatively unknown wedding venue! And it is a gorgeous space! I love the brick loft vibe and the art gallery ambiance! You can see the bride’s eye peaking through the bamboo shoots as she starts walking down the aisle! A wide angle photo of a wedding ceremony setup at the Floating World Gallery. Perfect location for an intimate wedding! Wedding Reception Photos at the Floating World Gallery! Truffleberry Market provided all the delicious eats! Here are mini fish tacos presented to Lisa + Ken on a custom made letter tray! Floating World Gallery from the outside- I love the modern architecture! The bride and groom definitely entertained us all with their first dance! So well choreographed! I love how you can see the motion in her dress at the end of their dance! The delicious dessert table by Truffleberry Market! Too much good stuff! One last photo of the bride and groom! Thanks to Lisa + Ken for having me as your wedding photographer! You were such a pleasure to work with! I felt so comfortable with your family and the great team from Truffleberry Market! And I love all the pictures from Lincoln Park: the Lily Pond, Villa D’Citta + Floating World Gallery! « Great Gatsby Themed Wedding! Sarah + Ed!